About the coming sea ice Armageddon! Summary: Every day brings a new warnings in the news media about the coming climate catastrophe. These go beyond known science, and often contradict well-established research. Despite that, they’ve terrified many people. For example, comments on leftist-friendly websites team with resigned predictions of doom for humanity — and even the biosphere. Today we again join the fight to show the truth. Ominous words in The Economist about the coming doom. The major short-term factor affecting arctic sea ice extent: the wind. Soot, another major long-term factor melting polar ice. Apocalypse delayed — about melting of the ice caps. Other posts about melting sea ice. Note: As usual on the FM website, we show only part of the large climate literature — the part that the news media tends to hide because it breaks the narrative of a consensus of scientists about anthropogenic and catastrophic climate change. Some of the journal references below are from Watts Up with That. Between now and early September, when the polar pack ice shrivels to its summer minimum, they will pore over the daily sea ice reports of America’s National Snow and Ice Data Centre. Its satellite data will show that the ice has shrunk far below the long-term average. This is no anomaly: since the 1970s the sea ice has retreated by around 12% each decade. Last year the summer minimum was 4.33m square km (1.67m square miles)—almost half the average for the 1960s. The Arctic’s glaciers, including those of Greenland’s vast ice cap, are retreating. The land is thawing: the area covered by snow in June is roughly a fifth less than in the 1960s. The permafrost is shrinking. Alien plants, birds, fish and animals are creeping north: Atlantic mackerel, haddock and cod are coming up in Arctic nets. Some Arctic species will probably die out. Perhaps not since the 19th-century clearance of America’s forests has the world seen such a spectacular environmental change. It is a stunning illustration of global warming, the cause of the melt. It also contains grave warnings of its dangers. The world would be mad to ignore them. 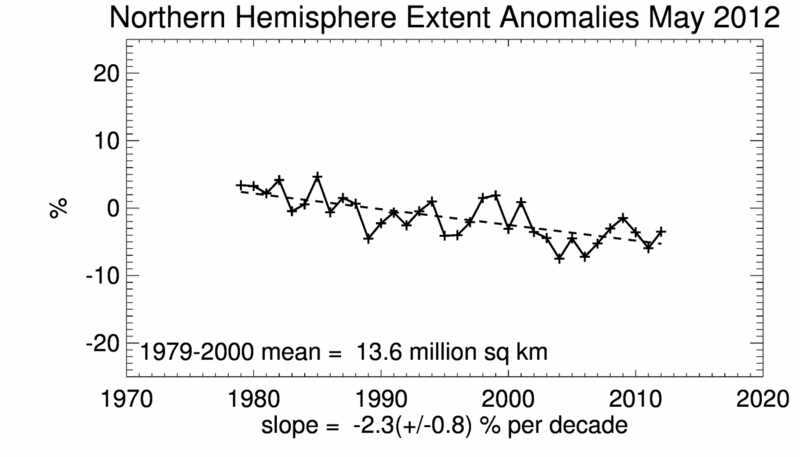 Scientists have tracked sea ice extent at both poles since satellite data became available in 1979. See for yourself! Here are graphs from the National Sea Ice Data Center and The Cryosphere Today of the Polar Research Unit of the University of Illinois. 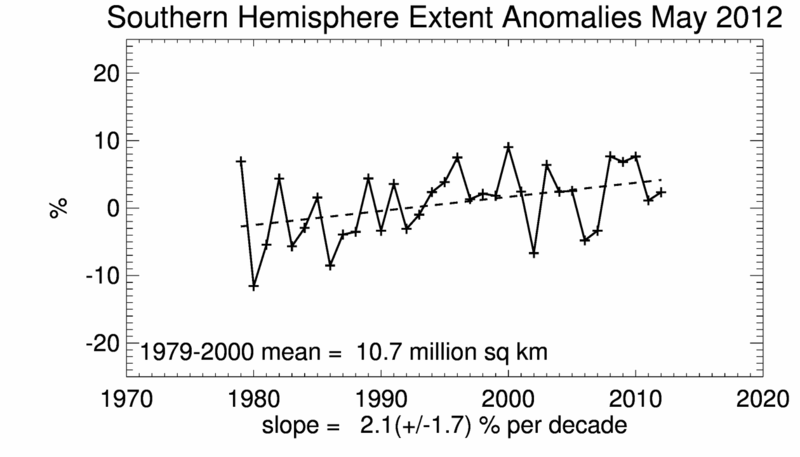 There is no trend in the northern total since 2000; there is little change in the global total since 1979. The first two show % changes in sea ice extent vs. the 1979-2000 average. The third graph shows total global sea ice area, and (at the bottom) the difference vs. the 1979 – 2008 average. Click on the graphs to see the full images. Wind strength and patterns cause much of the annual variation in the area and extent of the arctic ice. The 2007 and 2010 declines in polar sea ice resulted mostly from winds. The record low ice extent of September 2007 was influenced by a persistent atmospheric pressure pattern called the summer Arctic dipole anomaly (DA). The DA features unusually high pressure centered over the northern Beaufort Sea and unusually low pressure centered over the Kara Sea, along the Eurasian coast. In accord with Buys Ballot’s Law, this pattern causes winds to blow from the south along the Siberian coast, helping to push ice away from the coast and favoring strong melt. The DA pattern also promotes northerly winds in the Fram Strait region, helping to flush ice out of the Arctic Ocean into the North Atlantic. The DA pattern may also favor the import of warm ocean waters from the North Pacific that hastens ice melt. June 2010 saw the return of the DA, but with the pressure centers shifted slightly compared to summer 2007. As a result, winds along the Siberian coastal sector are blowing more from the east rather than from the south. Whether or not the DA pattern persists through the rest of summer will bear strongly on whether a new record low in ice extent is set in September 2010. “Rapid reduction of Arctic perennial sea ice“, S. V. Nghiem, Geophysical Research Letters, 4 October 2007 — Free copy here. “Summer retreat of Arctic sea ice: Role of summer winds“, Masayo Ogi, Geophysical Research Letters, 18 December 2008 — Free copy here. “Influence of winter and summer surface wind anomalies on summer Arctic sea ice extent“, Masayo Ogi et al, Geophysical Research Letters, 2 April 2010 — Free copy here. “Climate response of direct radiative forcing of anthropogenic black carbon“, Serena H. Chung and John H. Seinfeld, Journal of Geophysical Research, 1 June 2005 — Free copy here. “Aerosol organic carbon to black carbon ratios: Analysis of published data and implications for climate forcing“, T. Novakov, Journal of Geophysical Research, 8 November 2005 — Free copy here. Present-day climate forcing and response from black carbon in snow“, Mark G. Flanner at al, Journal of Geophysical Research, June 2007 — Free copy here. “Global and regional climate changes due to black carbon“, V. Ramanathan and G. Carmichae, Nature Geoscience, April 2008 — Free copy here. (a) How fast is Greenland’s icecap melting? How much does that raise global sea level? Previous Post Whither Greece after the election? Why do they stay on a doomed course? Next Post More death throes of the Constitution. Nothing remains in the ruins but politics. I found another buls**t blog by a moon landing denier. Your comment raises many questions. Are you attempting to make a point? Are you allergic to peer-reviewed research? Cool story bro! Thanks for showcasing the analytical abilities of the average citizen. This post is just an anthology of current research. These scientists deserve the credit. We’ll know much more in a few years. Your data is always interesting, but the observations of my admittedly short (64 and counting) lifetime strongly support a belief that the world is warming. I did read recently that the Battle of Monmouth was fought in 100 degree temperature so this week’s weather in New England is probably not unheard of, just quite unusual. I live in the Deep South (Memphis) where we are now 2.05 degrees C over normal for the past 12 months; we’ve experienced too many of these periods in recent years for me to be comfortable that nothing has changed. I can tell you that 2 degrees C is enough for many plants to decide they don’t want to live here any more. Clearly anthropogenic causation is harder to confirm, since this warming cycle began before the industrial revolution took full hold, much less the Age of Gasoline. However, it seems worth considering a risk calculation on this one. Most of human civilization has occurred during a short period of equable climate that apparently began about 7000 years ago. Clearly the Anasazi didn’t do too well when their climate fell outside an acceptable climatic range. I’m not sure it’s worth the risk to find out how our would fare under similar circumstances. Slater, I don’t understand much of what you said. You have personally been taking global temperature measurements, esp over the poles & oceans, for 64 years? Does anyone of sense not believe that the Earth has warmed over the past 64 years? Rule 1: weather (conditions here and now) are not climate. These little stories mean nothing. I have no idea what that sentence means. The subject is extensively discussed in these posts about shockwaves. As the history of the Anasazi shows, civilizations have risen and fallen due to natural climate change. Climate will continue to change, so saying “it’s not worth the risk” is absurd. It will happen, irrespective of our actions. In addition to natural variation, we are rapidly and substantially altering the biosphere, with climate change one of the effects (not necessarily the worst). As has been said here so many times, increased research is necessary to better understand these things. IMO the current programs of semi-secret clubs doing small-scale research will not provide reliable answers in an acceptable time frame. I saw a nature guide program recently about the Glacier Bay National Park (Alaska), possibly on one of the National Geographic cable TV channels, or similar. A 40+ mile glaciated bay was almost full at the point that the first europeans saw it, late 1700s. When John Muir visited, in the late 1800s, a large area (80%?) of the bay had already melted, and the industrial revolution had barely begun. History and Culture of Glacier Bay National Park, National Park Service. The melting coincided with the end of the “little ice age”. The last major ice age ended about 11,000 years ago, and the planet has lost vast areas of glacial ice since then. widespread agriculture became possible due to altered CO2 levels at the end of the ice age. Human culture as we know it is a result of glacial melting, not the other way around. Over the next 10 years, I predict, the mainstream of the environmental movement will reverse its opinion and activism in four major areas: population growth, urbani­zation, genetically engineered organisms, and nuclear power. Reversals of this sort have occurred before. Wildfire went from universal menace in mid-20th century to honored natural force and forestry tool now, from “Only you can prevent forest fires!” to let-burn policies and prescribed fires for understory management. The structure of such reversals reveals a hidden strength in the environmental movement and explains why it is likely to keep on growing in influence from decade to decade and perhaps century to century. The success of the environmental movement is driven by two powerful forces — romanticism and science — that are often in opposition. The romantics identify with natural systems; the scientists study natural systems. The romantics are moralistic, rebellious against the perceived dominant power, and combative against any who appear to stray from the true path. They hate to admit mistakes or change direction. The scientists are ethicalistic, rebellious against any perceived dominant paradigm, and combative against each other. For them, admitting mistakes is what science is. There are a great many more environmental romantics than there are scientists. The title took me for a loop. I thought it was going to be something about the economy again with the analogies toward the titanic hitting the iceberg. I read that Romans grew grapes in England. It is getting colder and colder ever since. Thank you for raising this issue. Yes, that’s often given as a rebuttal to global warming. It’s usually exaggerated, on several levels, by both sides. Let’s do a quick review. (1) Earth’s climate has warmed and cooled during the past few millenia. And there have been regional cycles on top of those. Since Roman times England cooled (little ice age), and warmed since the early 19th century. (2) The extent of viticulture in England before the Conquest in 1066 remains uncertain. There is too little reliable data. (3) There is a small wine industry today in England and Wales. It’s size and recent growth are often exaggerated by warmistas. Production was 18,300 million hectolitres/year in 1990-1994, and 19,375 in 2007-2011. That’s up 6% (1.2% per year) — not evidence of warming. From the English Wine Producers website. France produces 50-60 million hectolitres/year. “Medieval warmth and English wine“, Gavin Schmidt, RealClimate, 12 July 2006 — He’s a propagandist, but worth reading. Measurement in sea ice volume is on the frontier of climate science. Accuracy of satellite temperature measurements is still debated, and globla sea ice volume is a far less mature data series. For information about it see the Polar Science Center of the U of Washington: Arctic Sea Ice Volume Anomaly, version 2. Sea Ice Volume is calculated using the Pan-Arctic Ice Ocean Modeling and Assimilation System (PIOMAS, Zhang and Rothrock, 2003) developed at APL/PSC. Sea ice volume is an important climate indicator. It depends on both ice thickness and extent and therefore more directly tied to climate forcing than extent alone. However, Arctic sea ice volume cannot currently be observed continuously. Observations from satellites, Navy submarines, moorings, and field measurements are all limited in space and time. The assimilation of observations into numerical models currently provides one way of estimating sea ice volume changes on a continous basis. Volume estimates using age of sea ice as a proxy for ice thickness are another useful method (see here and here).